House search ~ another update! So, last time, things were not going great. A few days after I wrote that, I decided that enough was enough and I was going to start viewing anything and everything within budget and location. Then, a few days after that, another house came on the market in the village – brilliant, I thought. At this point, there were 4 houses for sale in the village within our budget (and one that is the lottery win buy), but 2 are cottagey and not really my cup of architectural tea. So, I booked the other two: the one I mentioned in the other post and the recently posted one. The latter (house #1) had the most wonderful garden with sea views (I didn’t even know you could see the sea from the village! I have since noticed you can see it from the road too, I hadn’t noticed before because I was always driving and obviously had eyes on the road), but because of all the land it came with, it was at the top top top of our budget if we stretched it a little bit (you get the idea!) and the house it came with was not that great. I was mentally extending and knocking down walls as I walked through it and, unfortunately, we wouldn’t have the money to buy the house and improve it. So that was a no. The other one (house #2) was a different matter: we really really liked the space. The photos on the website don’t do it justice at all, it’s very spacious and bright – though it could do with being reconfigured. But the price! We are sort of ok with the price but, like I said, it has been on the market for a long time with no price changes. I am not sure what to think, really. We also viewed a bungalow (house #3) just by the sea a couple of villages down the road – but it needs too much work – and the David Wilson new build (house #4) I mentioned on the previous post. To eat my words a little bit, husband really likes it as a space but everyone loves show homes, don’t they? They are made to be loved. They are warm, they are bright, they smell nice. We then visited one of their other type of houses on site and, to be honest, I felt a bit sorry for the neighbour on the back, who (potentially) paid £500k for their house only to have their garden and kitchen massively overlooked. I hope they got a nice discount. The one husband likes have views to open fields to the front and is apparently very nice, so who know, we might be visiting again. We are viewing house #2 again tomorrow and had pretty much decided it was a toss up between 2 and 4 when, yesterday, another house (#5) came on the market. It is literally 5 doors down from us and every time I go past I think “what a gorgeous house!” but (and it’s a big but!) they bought it last year, haven’t done anything to it which I know because I have been stalking the house market in this area since 2014 and are now trying to sell it for £40k more than they bought it for. It is, again, at the top top top of our budget and I could certainly live with it as it is, but I would be itching to rip carpets out (I hate carpets) and knock down walls, so I don’t know. We are viewing it on Monday, if only to rule it out (or possibly replace #4 as possible contender). Watch this space next week to see what happens in the next chapter! I have been wanting to write this rant for a bit now. But, as weeks turned into months, I had a phone call. From a job agency. And suddenly this isn’t a rant any more. I think. Maybe it still is. So, over the weekend I received a job alert on my email, a job (I thought) I was suitable for, in Bridgend – rather than in Cardiff or Swansea. Bridgend is such a short drive from us that it would be a dream to find a job there. So I applied. And I got a phone call from the agency the next morning. I spoke to the lovely lady and she said she was going to forward my cv and get some feedback the next day. So I waited. And waited. And the next day arrived. She rang and said it was a ‘no’. But somehow rejection didn’t feel that bad. It was miles better than having your cv ignored, to be honest. She said they were looking for someone with Revit and with a more technical portfolio, and that mine was very design-focused because I’m a designer. She said she would let me know if anything else became available. Now, I know rejection is not nice nice, but what I really mean is, now I have things to work on. Before, I was just thinking I am not good enough, not worthy of a second glance, or a phone call. Now I know that, even though I am not a good fit for this particular job, there must be someone out there who would like a design-focused person to join their company. And I have booked a Revit course too, so hopefully that won’t be an issue anymore. But, yes, job searching can be soul destroying. Hopefully it won’t be for long. I know. I know I am late. Half term makes everything late, right? And my website took a lot longer than I expected to be ready (and it’s still not 100% there but it’s now live and you can view it here – recommendations appreciated 😀 ) but here I am! Like I said, work. I needed a logo for my new business. I didn’t like any of the pre-made stuff I found – everything seemed very generic and I wanted something me. I unfortunately have zero money to pay a proper designer to do it. So I got myself on YouTube, bought myself a little graphics tablet and used the trial version of Illustrator to create my logo and a few of the graphics on my website. Now, I am not saying I am a professional graphic designer – I am very much not! – but I achieved what I was imagining, so I am really pleased with myself. I know I have already mentioned the beach last month and I suspect the beach will feature very, very often on these lists. On half term, the weather was beautiful and we drove down to the beach, but so did everyone else. We didn’t have change for the car park at the top of the cliff – a fiver! – so we drove back home and braved the muddy path through the fields. Took us about 30 minutes and it was oh. so. worth it. 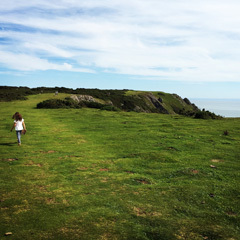 By the time we got to the seaside we were peeling off coats, as it was a scorching 11ºC and daughter even ventured into the sea (some boys were wearing shorts, we are not that Welsh yet). We also went up to the castle ruins up the cliff and she said it was the best day of her life. And not a single pound was spent. It seems amazing this happened in February, considering all the snow I am currently staring at. Looking forward to being able to it more often. Also on half term, we ventured to the local shopping centre for a day of shopping, as the little one finally seems to be outgrowing the 6-7s. I had very recently read on a very popular mums’ forum that the best hot chocolate ever was Whittard’s peanut butter one and it got me curious, so we went in. The regret for never having ventured before was instant. So much delicious looking stuff! We managed to come out with only a pot of hot chocolate (white chocolate + raspberry), some instant tea, a tea infuser and the best green tea ever on the face of the planet earth: passion fruit + mango infusion. Amazing stuff. Can’t wait to go back for the creme brûlée hot chocolate and some more fruity niceness. One of the only let downs of the move so far have been the local Odeon. Expensive, with ridiculously small seats, small aisles, generally cramped all around. I know we were terribly spoilt by Reading Showcase, which had the most amazing reclining seats and was cheaper than the Odeon in Maidenhead. So we decided to make the trip to our most local Showcase, which is in Cardiff and we are glad we did. It’s not a dissimilar distance from us than our old Showcase and, even though it doesn’t have reclining seats *sobs*, it is much more comfortable than the Odeon – people can go past you without you having to get up and there are no elbow issues with the surrounding seats. And the film, what a beautiful, lovely film. Even if the subject is a bit heavy, I just absolutely loved it. In the old house, I would always buy flowers for the house from the supermarket when I did my weekly shopping but I had stopped since we moved. Valentine’s Day brought it all back as my lovely husband bought me the most lovely bunch of flowers and when they were gone, I decided to replace them with daffodils. I have to say I was slightly disappointed when they opened and were not yellow but they so are beautiful.